Gorgeous Girl is quite taken with the soccer. I think it may have to do with the appearance of soccer snacks (in this house small bowls of potato chips, some rice crackers and some nuts) and the fact that the TV is on more than usual. She also takes great delight in identifying the Australian flags she sees hanging around the place. (Our local mall is decked out for soccer fever). Are you sitting down? I have a finished quilt to share. This has been finished for a while, it’s just taken me until now to get the pictures off the camera and on to the computer. The pattern is from an old issue of Australian Patchwork and Quilting Magazine, but I changed the border. I didn’t have enough fabric left to do a mitered border that extended the colours in the quilt. 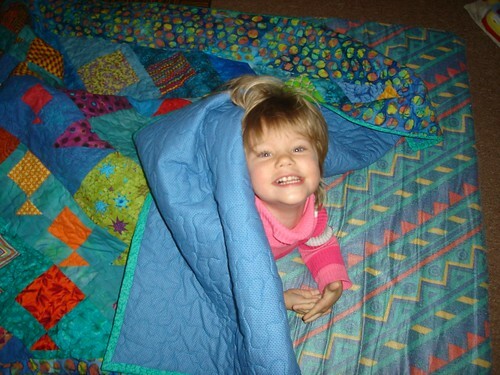 The quilt is a big hit with Gorgeous Girl. It is meant for her big girl bed (she’s still in the crib at the moment), but she insisted on getting out one of the camping mattresses to give it a trial run. We had quite a bit of excitement last week. I was working on the computer when one of our lightbulbs went pop. Then five minutes later the television went bang, bang, bang and smoke started pouring out of it. I phoned Gorgeous Man in a panic and he told me to go and switch all of the power off at the mains. There was a power surge (faulty power pole on our street). He made it home in 2 minutes and carried the smoking TV outside. It’s a gorgeous quilt! Congratulations on the finish! Ouch on all the fried electronics. 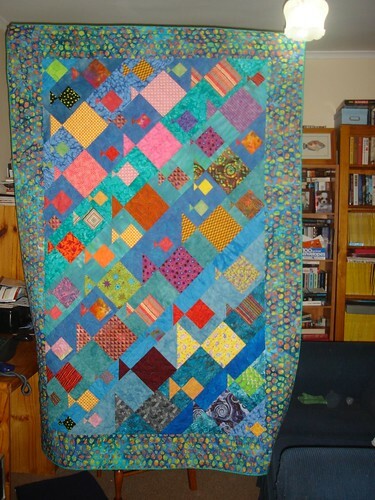 Beautiful quilt – glad to see it all in one piece, I remember seeing bits and pieces as you worked on it. Sorry about the electronics- thank goodness it didnt start a fire! How scary to have your electronics making noises and smoking! I’m glad you can still watch the World Cup games! Fantastic fish quilt. Is that Nemo, down the bottom right? hehe. The Aussies are ‘flagging’ just a bit, aren’t they, hanging on with their fingertips. I watched the game against Ghana, which was on at midnight here. Wish they were on through the day here! Hopefully we’ll thrash Serbia and get in on a few more matches. Great quilt – well done on the finish! sorry about the poweer surge – scarey stuff!!! I’m so sorry about the lost electronics. Thank goodness you were home! The Fish quilt turned out SO well! I love seeing it all together! Power surges are worse than lightening! I and I say that from experience. YIKES, Ruth!! That’s so scary! Oh, but your fish quilt totally rocks! 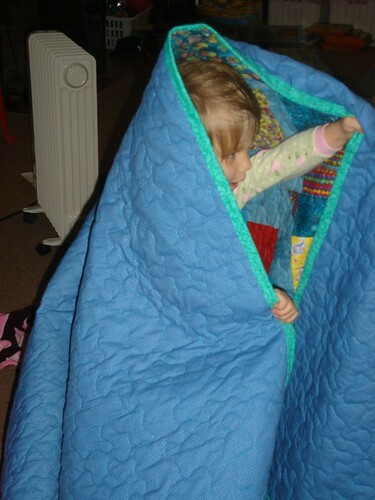 LOVE that fishy quilt… and very glad to hear to you avoided the worst of the power surge! The quilt looks gorgeous. I like all the bright colours. Too bad about your electrical stuff. I lived without TV for quite few years and didn’t really miss it at all.